UED stood for Ulster Electronic Developments, a record label set up by Pete Lloyd while at Queen's University in Belfast. Pete already had a company which made guitar amps (incl. a highly regarded bass amp) and Lloyd PA. The singles were recorded to help raise money for various charities in associaiton with Rag Week at QUB. The first single featuring Phil Coulter's Gleemen was recorded in 1963 and was Coulter's first ever recording. Some sources date it as 1964, but as "Foolin Time" was later recorded by The Capitol Showband and released on Pye in January 1964, this Rag Week single must pre-date it, making it a 1963 release. Phil (on piano and vocal) is backed by Rory O'Prey (guitar), Cel Fay (bass) and Phil McConnelogue (drums). Coulter gave copies of the single to Butch Moore and Des Kelly of the Capitol Showband while working a summer job in a hotel in Bundoran. They recorded it a few months later and it became the Capitol's and Coulter's first ever hit. 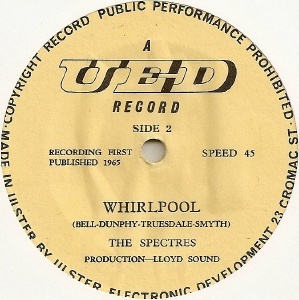 A second single on UED followed in 1965. 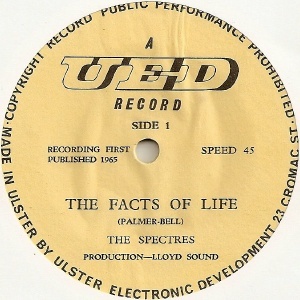 It was by The Spectres, from Belfast, and was written by Teddie Palmer, with the proceeds again going to various charities. Pete Lloyd went on to record the first Them singles. Both UED releases are now highly sought after.